It’s our second annual Marathon Month, a time we get to spotlight our patients who are running this year’s TCS New York City Marathon! 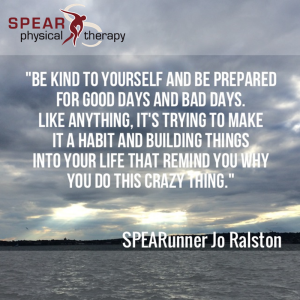 In this entry we check in with 84th Street SPEARunner Jo Ralston, who has been treating with Joe Losurdo, DPT in preparation for her first NYC marathon! Why do you run? For many reasons, and the list keeps growing. It started as cardio at the gym and then after watching friends run the London marathon for a second time it progressed to running to and from the office to avoid the tube. Living in London at the time it then progressed to running around Hyde Park and I realized it was an amazing way to discover parts of the city I had lived in for years but had no idea about! When I moved to NY, a friend was training for the Philly marathon encouraged me to join the NYRR and do the Jingle Bell Jog. After the first race I was hooked and I decided I would do a half marathon in January. After that it was the idea of completing the 9+1 to qualify for NYC just in case I felt like doing it! It’s such an amazing way to get outdoors and explore and it definitely helped me to settle in NYC quickly. It is also insanely easy to get involved in NYC with things like the NYRR, the hundreds of running clubs and meet-ups and now the crews like the bridge runners. Now if I don’t run it affects my mood, and while I don’t think or problem solve like some people describe, I do feel like I burn off any anger or frustration that is lurking. My other half says that he thinks I burn off my ‘[to keep things family-friendly, let’s just say Jo wrote a word that begins with “b” and rhymes with “rich”] points’ but it definitely makes me a much nicer, calmer subway rider! How long have you been running marathons? NYC will be my first although I trained for Philly last year and wasn’t able to compete at the last minute. For NYC, after a year running the 9+1 to qualify, plus the training I would have been gutted had I not been able to run on Nov 2nd! Which physical therapist do you see at SPEAR and what treatments have you been doing for training? Joe (with an e) is my therapist. The best thing he did was tell me on my first day that I would be ready for the marathon. I honestly had no idea what had happened and could barely stand or sit and I thought he was a madman for even suggesting I was going to be in good enough shape to run! Somehow I had inflamed my piriformis muscle which meant I felt like I had sciatica. Since then I have been doing a lot of foam rolling, monster walks, core work with planks and squats in addition to more simple stretches. I actually believe that despite reducing my mileage I am now in better shape than ever for the marathon. Do you have any words of wisdom or training tips for anyone thinking about doing their first marathon? I think its setting small goals. When you look at a 16week training plan or think about 26.2 miles it is overwhelming so just go week by week or even day by day. Be kind to yourself and be prepared for good days and bad days. Like anything, it’s trying to make it a habit and also building things into your lifestyle to remind you why you do this crazy thing. I am also really motivated by the idea of two or three shake shack burgers when I finish, maybe that will work for others too! Oh and Pinterest running motivation boards – strangely helpful!